· You won’t necessarily see a nice linear trend in sales/downloads. Things can stay stable for a few days, then take off. Momentum builds on itself - nothing succeeds like success. · It’s not easy to hit really big numbers without the help of the U.S. market. However, the smaller markets can foreshadow later progress in the bigger markets. That’s even true of markets outside the English speaking world. In this blog, I will look a couple of the main factors that might have caused the positive reception for the books, especially two that are widely thought to be influential – cover and title. The strip of images below shows some representative covers in the category Children’s Books/Mysteries and Detectives/Animals/Cats. I decided not to simply use the top 5 books, as they all related to the same series (“Warriors” – I guess it is a cat thing). It seems clear that having an image of a cat is very common in this category – no surprise. In a couple of cases the cat image was small, once overshadowed by a dog and once a bit too small to be clearly made out. The Summer-Cottage Mystery cover’s cat is very prominent and, in fact, is the only image on the cover. The others tend to be quite a bit busier. So, in this category, having a strong, eye-catching cat image seems to have been very helpful. In the matter of fonts, there is quite a variety. Many of these are “fat fonts”, which are meant to appeal to a younger child, I suppose. There is also a lot of curviness to these fonts, arcing across the page and so forth. The Summer-Cottage Mystery cover’s font was Times New Roman. That seems to go against the grain, in this case, though it worked, as plenty of people downloaded the book or bought it. It is possible that a more grown-up font may have attracted a parent’s eye, or might have attracted a child’s interest as being different. The other main visual element is colour. Most of the covers went in for lots of colour, primarily pastels or earth tones. I imagine the idea is that those are soothing colours that would appeal to kids. The Summer-Cottage Mystery cover’s colours were very muted, if not to say black and white. Again, that goes against convention, though it worked. Once more, it could have been a case of a different visual style standing out and attracting attention. The cat on The Summer-Cottage Mystery cover was fairly naturalistically rendered, though it did come from a drawing (by our artist, Leona Olausen). The others were done in more of a cartoon style. So, the upshot seems to be that The Summer-Cottage Mystery went along with the cat image, but deviated in the matter of font, colour, image style and general business. So, perhaps it was a matter of being similar enough to fit into the important genre trope, but different enough to stand out. In terms of the title, there was a tendency to use the word “cat” or some variation (3 of five books). We didn’t use that, but the cat image was probably good enough to put the idea across, that this book involves a cat in some way. It is possible that the sub-title “A Children’s Story” was helpful, to ensure that prospective readers (children and parents) were aware that this mystery would not be violent or very scary. Once again, I decided against using a selection from the top 10, as they were dominated by a few series (especially Nancy Drew and Hardy Boys - some things never change). The selection below are drawn from a bit further down the rankings, though still quite high. The first thing that strikes one, is that the images in this category appear to be intended for an older audience. Whereas the cat book covers seem to be directed at the pre-school to mid-elementary market, these pictures look like they are intended for a later elementary to junior high crowd. In this group, the Summer-Cottage Mystery also stands out, as quite different from the rest. The other covers have fairly complex, somewhat photo-realistic artwork. They are more likely to feature people and landscapes. Perhaps the saving grace of our cat image in this bunch is that it too is fairly photo-realistic, and therefore can appeal to this slightly older demographic. These covers also tend to portray an element of mystery. The cat picture actually does this as well, when seen closer up – it started off as a witch’s cat on an SF cover for a book directed at grown-ups. We didn’t use the cat for that cover at the time – that was probably a mistake – I didn’t realize the power of cats, especially in the on-line world J. The Times New Roman font probably also helps to position the cover to be acceptable to an older child. It appears that covers meant to appeal to this group are transitioning from the cartoonish fonts to more staid, traditional fonts. Similarly with the colours. Generally they are fairly muted in these covers, so the grey background and the black and white cat don’t necessarily seem out of place. The titles generally telegraphed something of the content of the stories. The term “Mystery” was on three books (including ours), while one of the others used the term “caper” and another used the term “code name”. Only “Summer in the Woods” departed from that tendency. 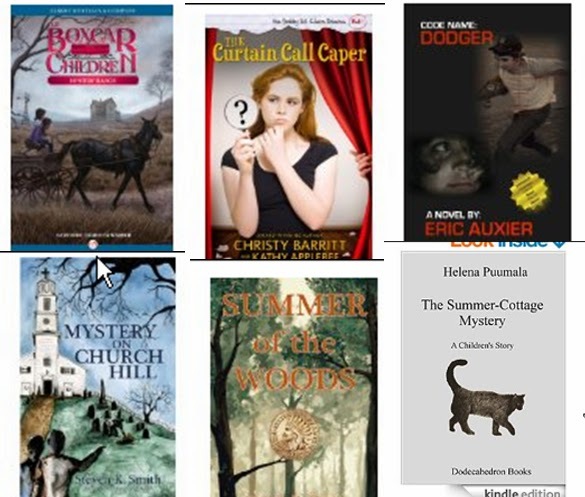 In summary, the Summer-Cottage Mystery cover appears to have resonated with viewers in both the “Cats” and “Detectives” categories. It seems to have hit some tropes of each category, but also was sufficiently counter to some other tropes to stand out, catch the eye and make the potential reader curious. This was just fortuitous – certainly not planned. To be honest, I put the cover together fairly quickly, without a lot of thinking, going by instinct. Perhaps that’s just the way these things work out, much of the time. · Post-hoc. That just means “after the fact”. It’s easy to see patterns that explain something that has already happened. It’s better if you form hypothesis before the experiment or observational study, then test them to see how well they conformed to reality. · Are not quantitative. It is difficult to measure things like artistic style or emotional tone with numbers, so these results are a bit vague and speculative (qualitative data is another term used for this). All that being said, life is often messy, imprecise and qualitative (especially in the domains of literature and fiction), so we have to do our best with the data we have.